I can understand people searching for Atlantis, or Shangri-La, El Dorado or whatever is one's favorite lost city/continent/civilization, but, c'mon Ithaca? Why search for something whose location already exists, and it is, (surprise), Ithaca. I remember reading about the book coming out of the project to identify Homeric Ithaca with Cephalonia. The main argument for denying Ithaca's claim to be itself was that the Homeric account can't be reconciled well with the reality of the island, e.g., the idea that Ithaca is the westmost of the Ionian islands, which doesn't correspond to its real location. I always thought this was a shoddy argument. Greece has thousands of islands, and I'd bet that with the exception of locals, geography wizards or career seamen, very few people know the exact location on the map of most of them. Why would Homer, or whoever composed the Odyssey, who, most likely live in the west coast of Asia Minor, know the relative position of Ithaca or the details of its geography? Greeks yesterday hailed a new study showing the modern-day island of Ithaca is the same as that of Homer's legendary hero Odysseus, rejecting a recent British theory that pointed to a nearby island. British researchers last year claimed they had solved an intriguing classical puzzle, saying the kingdom of Ithaca was located on another Ionian island, further west. «This new study shows how wrong and inaccurate the British theory is,» Ithaca councilor and former island Mayor Spyros Arsenis told Reuters of the study conducted by Greek geology professors and other scientists over eight months. Arsenis also heads the island's Friends of Homer society. The British study - which suggested that Homer's Ithaca was actually part of what is modern-day Cephalonia - had enraged islanders who are fiercely proud of their renowned ancestor, the wiliest of the ancient Greek writer's epic heroes. 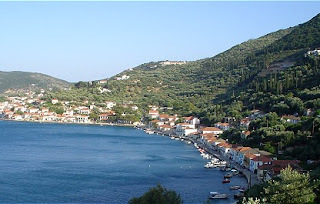 The British team suggested that drilling showed the Paliki peninsula on Cephalonia may have once been an island and that it better matched Homer's description of the homeland which Odysseus left behind to fight in the Trojan War. «The new Greek study shows... the geological formations could not have been formed in just 3,000 years and there is no evidence of any sea channel,» Arsenis said. The study will be officially presented next week. The island's local council also welcomed the results. «This study rules out once and for all the theory that the Paliki peninsula was once a separate island. It is a slap in the face for the British researchers,» it said in a statement. Finding ancient Ithaca could rival the discoveries in the 1870s of ancient Troy on Turkey's Aegean coast and the mask of Agamemnon, who led the Greek forces against the Trojans. No one knows for certain whether Odysseus or his city really existed. The discovery of the ruins of Troy, where Odysseus, Achilles, Paris, Menelaus and other Greek heroes did battle, has led scholars to believe there is more to Homer's tales than just legend. Who is that in your new banner near your logo at the top of your page? How real was the debate on this though?! Lots of times various authors always like coming up with wacky crap, like "Homer in the Baltic" or whatever. This entire argument is redolent of public relations as anyone could recognize the potential for tourism based on the findings, the research for which as paid for by the communities themselves...and surprise! The results upheld their original claim. Gives archaeology of the classical world a worse name than before..it's right down there with finding Noah's ark.